Tripura is a state in Northeast India. The third-smallest state in the country, it covers 10,491 km2 (4,051 sq mi) and is bordered by Bangladesh (East Bengal) to the north, south, and west, and the Indian states of Assam and Mizoram to the east. In 2011 the state had 3,671,032 residents, constituting 0.3% of the country's population. The Bengali Hindu people form the ethno-linguistic majority in Tripura. Indigenous communities, known in India as scheduled tribes, form about 30 per cent of Tripura's population. The Kokborok speaking Tripuri people are the major group among 19 tribes and many subtribes. Within its small geographical area, Tripura offers plenty of attractions for the tourists in the form of magnificent palaces ( Ujjayanta Palace and Kunjaban Palace at Agartala and Neermahal - Lake Palace at Melaghar ), splendid rock-cut carvings and stone images ( Unakoti near Kailashahar, Debtamura near Amarpur and Pilak in Belonia Sub-divisions ), important temples of Hindus and Buddhists including the famous Mata Tripureswari temple ( one of the 51 Pithasthans as per Hindu mythology ) at Udaipur, vast natural as well as artificial lakes namely Dumboor lake in Gandacherra subdivision, Rudrasagar at Melaghar, Amarsagar, Jagannath Dighi, Kalyan Sagar, etc. at Udaipur, the beautiful hill station of Jampui hill bordering Mizoram, wild life sanctuaries at Sepahijala, Gumti, Rowa and Trishna, eco parks created by forest department at Manu, Baramura, Ambassa and rich cultural heritage of Tribals, Bengalis and Manipuri communities residing in the state. 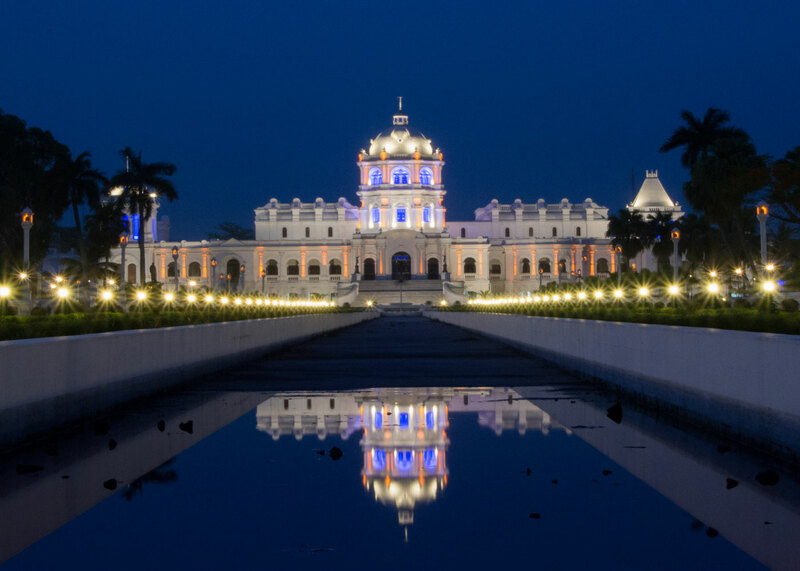 The main attractions in Agartala are Ujjayanta Palace, State Museum, Heritage Park, Tribal Museum, Sukanta Academy, M.B.B. College, Laxminarayan Temple, Uma Maheswar Temple, Jagannath Temple, Benuban Bihar, Gedu Mian Mosque, Malancha Niwas, Rabindra Kanan, Purbasha, Handicrafts Designing Centre, Fourteen Goddess Temple, Portuguese Church etc. ( 8 Days / 7 Nights ) as per itinary for 04 pax. net Rs. 7500 /- per head ( INCL. ALL OF TAXES ) RASOI TOURS & TRAVELS( Authorised By Tripura Tourism ), Phone: 033 – 25822100 Mobile: 9836036786 / 9831840148 / 9433506786. Agartala Arrived at Agartala Airport.Visit Ujjayanta Palace,Indo-Bangla Border on road then Journey to Commila View Resort( Kamalasagar ).Night stay here ( A/C Room ). Kasaba Kali bari Visit Kasaba Kali bari Temple,Bangladesh Border Stay at Commila View Resort ( A/C Room ). Neermahal Visit Neermahal via Sepahijala Forest.Night halt at Sagarmahal Tourist Lodge ( A/C Room ). Udaypur Visit Udaypur local sightseeing,Tepania Eco Park & Tripureswari Temple Night stay at Sagarmahal Tourist Lodge( A/C Room ). Unakuti Visit Baramura Eco Park-Khumulwng Eco Park-Unakoti sightseen.Night halt at Unakuti T/L ( A/C Room ). Jumpai Hill Jumpai Hill Sightseeing & night halt at Eden T/L ( Non A/C Room ). Agartala Back to Agartala visit Purbasa Handicraft Emporium(Govt.Of Tripura),Ramkrishna Mission,Satsangha,Night halt at Agartala ( Non A/C Room ). Back to Airport After hotel check out back to Airport.